I just booked my trip to Atlanta for Automation Fair 2016 and I'm pumped! During last year's event, I was a newbie at Grace and a deer in the headlights of the juggernaut event that took place in Chicago's McCormick Place. For a little perspective, that's where they host "The Nation's Largest Car Show". I'm looking forward to seeing some of you there as I did last year. That's when the blog got real for me; when people at the largest automation industry trade show came up to me and said they read HUMPDAY all the time. It was a surreal moment and I just remember thinking at Chicago's Automation Fair, "They're real! The people who read the blog are real people!" Anyways, since I assume you real people are still reading, I just wanted to remind any and all of you who are planning on attending the fair this year to get signed up. If you haven't already, please register now. Lastly, if you can't make it to Automation Fair, don't forget to sign up for the next best thing! 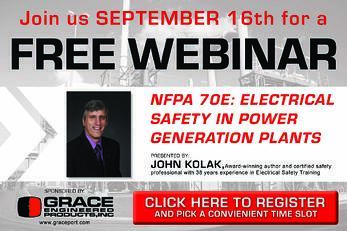 This Friday we'll be hosting a FREE live webinar with safety expert, John Kolak. John will be covering NFPA 70E: Electrical Safety in Power Generation Plants. Click below under upcoming events to register.